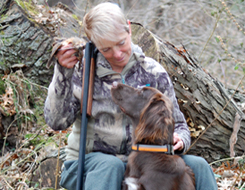 Deutsch Langhaars are a true versatile hunting dog. 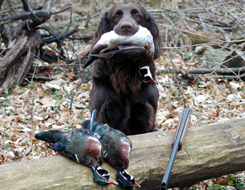 The breed is bred for feathers, fur, and to be a true hunting companion! We train all of our dogs, from start to finish. All of our dogs are German-registered, tested within the German system, and bred to the German standard. All of our pups are introduced to the water and birds at the age of six weeks, as well as fur. All of our dogs are raised in the house. We breed our dogs for good temperament, calmness, natural ability, and longevity. The Deutsch Langhaar is bred to hunt in any kind of water, or any type of terrain. 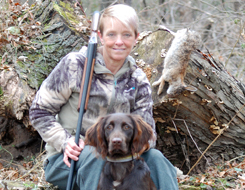 These dogs excel hunting high up in the Colorado mountains, in the open prairies of South Dakota, wetlands across the country, and through the dense thickets of the Northwoods. Deutsch Langhaars are strong in the field, water and woods! We test our dogs in two different testing venues. There is a spring test, and a fall test. The spring test is called a VJP, which is a breed test for which the natural hunting abilities of the young dog. The young dog is tested on how the dog uses the nose, the tracking, the search in the field, and pointing. The young dog is tested on the dog's cooperation as well. The fall is called a HZP. This testing venue will test the dogs determination of the development of the natural abilities of the young dog in view of it's suitability and future use as a versatile hunting dog and as a breeding dog. The dog is tested on tracking, the use of their nose, and how the dog searches in the field and/or water. They also are tested on the dogs manner of retrieving of freshly killed birds, and on their feather and fur drags. The males weigh from 70 pounds to 85 pounds. Their height is from 60 to 70cm. The females weigh from 55 pounds to 67 pounds. Their height is from 58 to 66cm. The Deutsch Langhaars are shedders. They shed their coat twice a year-in the spring and fall. If you have any question about us, or the breed, please feel free to contact us by phone or email. We would be glad to help you out. Check out www.dl-gna.org where you will find additional information about the Deutsch Langhaars.